One would think that after all the years, all the albums, and the Napster debacle, Metallica would have called it quits. Apparently the opposite holds true for Milwaukee fans. The show is sold out in the lower level, and people are still looking for good Bradley Center tickets for that show. 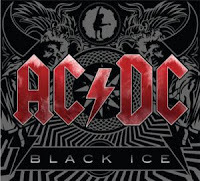 AC/DC came out with their album this week. It hit the charts at number one in thirty countries. Walmart reported sales topping 750,000 in the first week that Black Ice filled the store shelves. This is album number 15 for the old men of rock and roll. It beat out High School Musical 3 in sales. That makes this music fan very happy. Spin Magazine gives this one two devil horns up. Other reviews compliment the production. Musicradar.com calls this one a "Rock and Roll masterpiece." Other words that I hear on the street is that this cd came out at just the right time. I guess that waiting eight years works for this aged group of legends. It works for me. Even though this album was leaked out prior to release, it still blew through the charts, and that is just another testament to the quality of the songs. Some reviews have pointed out that there are three songs with the words "rock and roll" in the title. So what? That's what this band is all about.